• The 3 quotes below help explain Islam’s decline, eventually resulting in the last jihad attempt into Europe at Vienna on September 11, 1683. I just returned from Cordoba, Spain, where Averroes lived and worked. It was a thrill to walk the same streets as he and Maimonides had. Avicenna and Averroes represent the highest attempt to assimilate Aristotelian and Platonic philosophy into Islam - to reconcile reason and revelation in the Muslim world. Averroes did have a huge impact, but it was mostly on Europe, not Islam. If you want a date on which the Muslim mind closed, 1195 A.D. might serve as the marker. It was then that Averroes's books were burned in the city square, that he was sent into exile, and that the teaching of philosophy was banned. His works in Arabic today have been back translated from either Latin or Hebrew, the languages in which most of his books were preserved. Reason was rejected... because there is nothing for it to know. Reality is composed of a series of instantaneous miracles directly caused by God's will. Everything is directly done by God, who acts for no reasons. The catastrophic result of this view was the denial of the relationship between cause and effect in the natural world. Therefore, what may seem to be "natural laws," such as the laws of physics, gravity, etc., are really nothing more than God's customs, which He is at complete liberty to break or change at any moment... If creation exists simply as a succession of miraculous moments, it cannot be apprehended by reason. As a result, reality becomes incomprehensible. ... In The Incoherence of the Philosophers, al-Ghazali (1058-1111), perhaps the single most influential Muslim thinker after Mohammed, vehemently rejected Greek thought: "The source of their infidelity was their hearing terrible names such as Socrates and Hippocrates, Plato and Aristotle." Al-Ghazali insisted that God is not bound by any order and that there is, therefore, no "natural" sequence of cause and effect, as in fire burning cotton or, more colorfully, as in "the purging of the bowels and the using of a purgative." Things do not act according to their own natures - they have no natures - but only according to God's will at the moment. In fact, the rejection continues to this day. Muslim scholar Bassam Tibi states that "because rational disciplines had not been institutionalized in classical Islam, the adoption of the Greek legacy had no lasting effect on Islamic civilization . . . contemporary Islamic fundamentalists denounce not only cultural modernity, but even the Islamic rationalism of Averroes and Avicenna..."
The denial of natural law removed the very objective of science from the Muslim mind. Since the effort of science is to discover nature's laws, the teaching that these laws do not, in fact, exist (for theological reasons) is an obvious discouragement to the scientific enterprise. How can science proceed without cause and effect? You must say that a rock falls because God made it fall at that instant. To say gravity did it becomes a blasphemous statement. The extent of the discouragement and the paucity of scientific research this has produced is, if predictable, still astonishing. Pakistani physicist Pervez Hoodbhoy has noted the major scientific contributions of Islam's Golden Age in the 9th to 13th centuries. Then he writes, "But with the end of that period, science in the Islamic world essentially collapsed. No major invention or discovery has emerged from the Muslim world for well over seven centuries now." I give the statistics from the UN on the paucity of science in the Arab Muslim world in my book. “Reilly chronicles how the giants of Muslim philosophy, such as Ghazali and Ashari, concluded that knowledge was unknowable, that moral truths can only be ascertained through revelation. Accordingly, all knowledge—the very bounds of reality—came to be limited to the words of the Quran and its pronouncer, Islam’s prophet Muhammad. Similarly, the spirit of inquiry perishes: “the only thing worth knowing is whether a specific action is, according to Shari ‘a: obligatory, recommended, permitted, discouraged, or forbidden. The rest is irrelevant.” ... This is also why in the last millennium Spain alone has produced more books than the Arab world in its entirety. But in Islam, Allah is absolutely free. Al-Ghazali and others took issue with the very idea that there were laws of nature; that would be blasphemy, a denial of Allah’s freedom. To say that he created the universe according to consistent, rational laws, or that he “cannot” do something—as Aquinas affirms here—would be to bind his absolute sovereignty. His will controls all, but it is inscrutable. Thus modern science developed in Christian Europe rather than in the House of Islam. In the Islamic world, Allah killed science.” The Politically Incorrect Guide to Islam, p. 95. 2) The scarcity of Muslim Nobel Prizes. 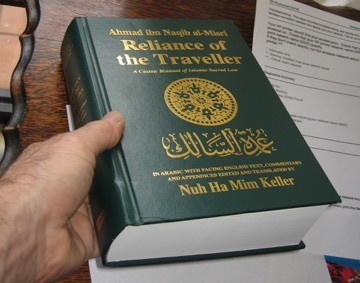 • By the way, the Reliance of The Traveller (Umdat al-Salik) explains Islamic law on killing apostates (o1.0, o8.1), killing adulterers by stoning (o1.0, o12.2, o12.6), amputating hands and/or feet of thieves (o14.1, o15.1), obligatory female genital mutilation (e4.3), killing blasphemers (o11.10), honor killing (o1.2. (4)), killing homosexuals (o12.2, o12.6), wife beating (m10.11), and lying (r8.2-3, r9.1-2, r10.1-3). It’s important to note this book was not certified by Al-Azhar’s Department of Extremism™, it was certified by their General Department for Research, Writing, and Translations. This book proves those 9 things are condoned by at least some of the highest authorities in orthodox Islam past and present, so people who say they do not even exist in any part of sharia law are either lying or don’t know what they are talking about. This chart shows other authoritative sources. These universal human rights abuses institutionalized under Islamic law are given cover in the war of ideas by the extraordinarily deceptive term “Islamic Human Rights”. Many are not even aware of this war of ideas because of the lie by Muslim Brotherhood orgs that only a Tiny Minority of Extremists™ take the things in Reliance seriously, and the success they have had keeping the entire topic out of any public discussion. One tactic is promoting the idea it’s Islamophobic™ to even suggest any of it exists. Another tactic is to squash free speech and simply throw you out of University functions for asking about the book. Brotherhood front groups MSA & CAIR sponsored an Interfaith Dialogue™ at U. of Central Florida that was hosted by Edina Lekovic, the lying Bosnian Muslim American Communications Director for MPAC, and popular university speaker Jamal Badawi, Ph.D., known as a senior Brotherhood leader to the FBI since at least 1988. To see this deception about Reliance watch the video that follows with Badawi & Edina Lekovic sitting next each other on the panel. Even though Badawi sits on the board of FCNA, whose glowing review appears in Reliance, watch this clip where he is asked about the book and throws up a smokescreen by questioning translations and interpretations of the Koran and Sahih Bukhari & Sahih Muslim. Besides being irrelevant, the translations most commonly used (also in this website) being any issue is another deception because they are the same posted on MSA’s website (see Core Islamic Texts). Combining the suppression of information about Islamic law with the threat of losing your job or being called an Islamophobe™ for asking works very well to keep people silent and most people in the dark. “If they had gotten rid of apostasy punishment Islam wouldn’t exist today”.